Afternoon. Hope your all enjoying this gorgeous sunshine. Some heat we have had. It may be hot but doesn't mean Christmas crafting has to stop. It was a pleasure to receive my Hunkydory magazine issue 18 and see some of my cards in the issue with my name at the side. Under the starts topper sheet. Centura pearl - Snow White hint of silver - Crafters Companion. 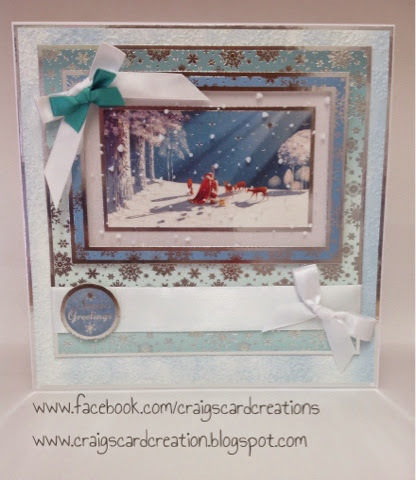 Snowflake Embossalicious vintage Christmas embossing folder - Crafters Companion. 10mm - Dark aqua satin ribbon - American Crafts. Wonderful card! Great layout. Thank you for joining our challenge at Creative Card Crew.